The Perth Mint of Australia announced July 12 the availability of a new 2018 Australian Koala 1oz Silver Bullion Coin with a miniature Labrador dog as a privy mark. Targeted for collectors and investors who like coins with more limited mintages, only 15,000 of these will be sold. Last year’s lunar version had a rooster privy mark and it was limited to 25,000 pieces. The Perth Mint shows it as sold out. Coins often carry a small mintmark, usually a single letter, to identify where they are made. In the early 1990s, the Perth Mint began adding tiny privy mark symbols to some limited-edition coins to increase their numismatic appeal. Reverses of standard 2018-dated Koala coins depict a koala in its favorite place to rest and eat, a flowering eucalyptus tree. This coin bears the same general design but also has a distinctive Lunar Dog privy mark to the left of the koala’s head. "On this special Australian Koala the privy mark portrays a Labrador retriever to mark the Chinese lunar year of the dog," The Perth Mint describes. "The animal ‘ruler’ of 2018, 2006, 1994 and every 12th preceding year back to the time of Buddha, the dog has good-natured and loyal characteristics which are said to exist in everyone born under its influence." 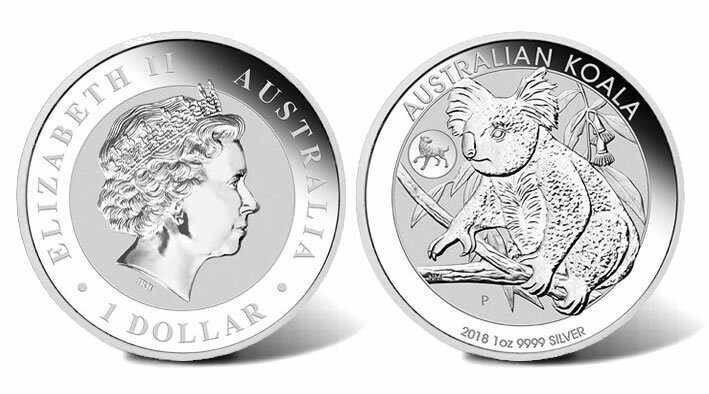 Reverse inscriptions include AUSTRALIAN KOALA, 2018, and 1oz 999 SILVER. Coin obverse offer the Ian Rank-Broadley effigy of Her Majesty with inscriptions of ELIZABETH II, AUSTRALIA and 1 DOLLAR. The Koala coin with dog privy mark is sold on perthmintbullion.com and is also distributed by APMEX (www.apmex.com) internationally.